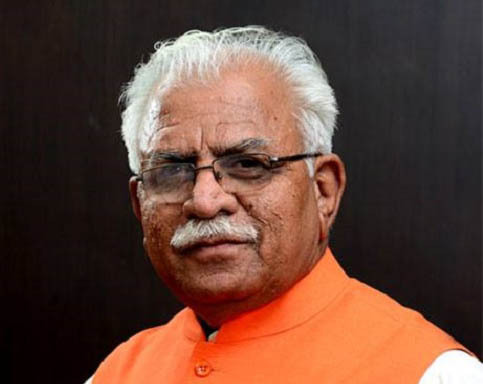 Chandigarh, May 29 –The Haryana Chief Minister, Mr Manohar Lal, has said that the state government would offer about 10,000 jobs to youngsters every year. Efforts are being made to fill up about 50,000 vacant posts in the state out of which 30,000 posts have already been advertised. Addressing a largely attended Vikas rally organised by Ladwa MLA, Dr. Pawan Saini, at Ladwa in Kurukshetra district, today, the Chief Minister said, “But if we factor in reservation in these jobs, only 20 or 30 youngsters would get government jobs in each Assembly constituency. Therefore, youth should focus on launching self-employment ventures and look for jobs in private organisations”, he added. Reiterating his resolve not to tolerate corruption, Mr Manohar Lal said that the state government would take action against corrupt officers and employees even at block and tehsil level. “If any person gives information about corrupt officers and employees even at mid-night, the government would promptly take action”, he said. Efforts are being made to fulfil the promises and resolutions made by both the state government and the Central Government. With a view to bringing transparency, admissions in schools have been linked with Aadhaar Card. With the adoption of this procedure, four lakh admissions were found fake due to which, the government had to close 350 schools. Apart about 450 B.Ed colleges in the state which were only giving degrees. The state government is working towards improving the education system. A committee has been constituted which would work on improving the education level right from school to university level. In the first phase, work has been started to introduce monthly, half-yearly and annual examination in schools and 100 girls’ colleges would be opened after carrying out mapping, he added. The Chief Minister announced a bonanza of schemes worth Rs 150 crore for the Ladwa Assembly constituency. Schemes would be implementedin 182 daysto make every ward in the villages and city clean. Plans have been made to spend about Rs 150 crore on various development schemes and renovation projects in the Ladwa Assembly constituency. A sum of Rs 115 crore has already been spent on such works without making any announcement at public meetings during the last one year. He said that the demands put forth by Dr Saini would be fulfilled, and, if any administrative issue came in the way, it would be sorted out. A state-level committee has been constituted for giving the status of sub-division to Ladwa and the status of block to Pipli. The report of the committee would be presented and approved by the Cabinet. A sum of Rs 2 crore would be spent on the sports stadium to be set up on six acres of land in the Ladwa constituency, Public Health Centre in Babain would be upgraded to the level of Community Health Centre and specialist doctors and doctors of MD level would be appointed in Ladwa CHC next year after completion of the recruitment process. Besides, Rs 8 crore would be spent on the construction of Industrial Training Institute in Ladwa and two sectors, Sector-2 and 5, would be constructed after preparation of Plan-2031 of the Haryana Urban Development Authority and Rs 2 crore would be spent on the completion of work on the bus-stand on 10 acres. The Chief Minister announced that Rs 6.5 crore would be spent on taking underground the overhead electricity wires in the residential areas of Pipli; Rs 16 crore on four-laning of the 4.5-km-long Kurukshetra-Ladwa-Saharanpur road; Rs 8.5 crore on four-laning of the 2.5-km-long Ladwa-Babain road; and Rs 13.50 crore on four-laning of the 4.2-km long Ladwa-Indri road. He said that the Government Veterinary Dispensary in Kaulpur village would be upgraded to the level of veterinary hospital and the facility of ultrasound machine for animals would be provided by the state government. The Chief Minister also announced Rs 5 crore for development works in the Ladwa constituency and Babain and additional budget of Rs 15 crore for development of villages. The Minister of State for Welfare of Scheduled Castes and Backward Classes, Mr. Krishan Kumar Bedi, Minister of State for Food and Supplies, Mr. Karan Dev Kamboj, Minister of State for Renewable Energy, Mr. Nayab Saini, Member of Parliament, Mr. Raj Kumar Saini, Chief Parliamentary Secretary, Mr. Shyam Singh, MLA Thanesar, Mr. Subhash Sudha, OSD to Chief Minister, Mr. Amrinder Singh and other dignitaries were also present on the occasion.